Pilot study finds mood of chronic pain patients is boosted by left-field use of ultrasound machine. Could it work for all of us? The unusual idea occurred to Dr. Stuart Hameroff (above) after he heard about ultrasound studies on the brains of mice. Ultrasound equipment—which uses sound waves to see inside the body—is familiar to anyone with children as it’s used to check the health of an unborn child. 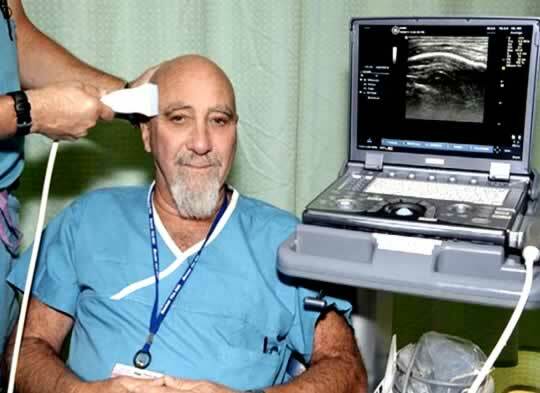 But what would it do, Dr Hameroff wondered, if he used the ultrasound machine on the human brain? He suggested to his colleagues that they should try it on patients with chronic pain to see if it would help. His colleagues said he should try it on himself first. The feeling continued for a couple of hours. But perhaps this was all placebo: he expected to feel different and so he did. The only way to get solid evidence was to conduct a study where neither patients nor doctors knew whether the ultrasound machine was switched on or not, then look at the difference between groups. The pilot study is now being followed up in double-blind clinical trials on more patients and using doses of ultrasound up to 30 seconds. The results of this study are currently being analysed.